I wear pleather jackets with just about everything, so I love that they are having such a moment right now. There are so many different faux leather jackets out there right now, I love that we have so many options for them in plus size fashion. Seeing a trend come over into plus makes me so happy, I just had to share some of my favourites. A good biker jacket can last for years (yes, even a pleather one! ), and be worn all year round as a great investment. This New Look jacket is a classic biker style dream. This yellow colour is amazing, but if yellow isn't your thing, they also sell it in red and green, and a similar but slightly more expensive silver version that is totally lush too! I love biker jackets and I feel like this is my Pokemon jacket. I want to collect them all! Pins are such a hot trend right now, and if you don't want to customise your own jacket this is a cute way of following the trend without the DIY effort. Pins generally start at £5 a pop at a minimum, so this is also probably a cheaper way to do it. 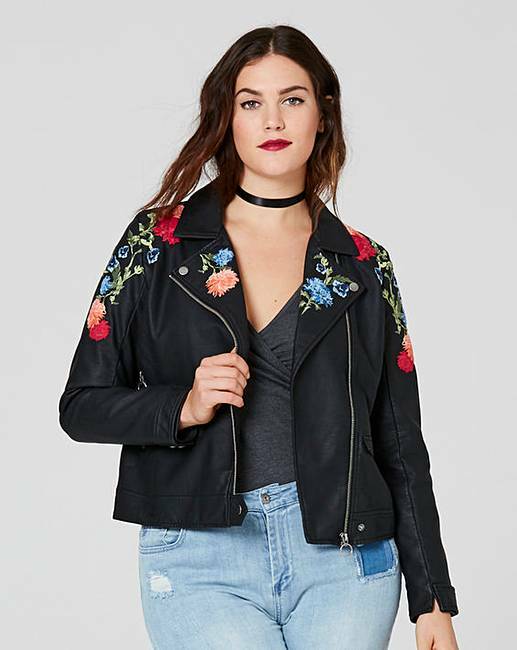 Embroidery is another trend that I am absolutely loving right now, and an embroidered faux leather jacket is the perfect mix of feminine and rock and roll. The way that the embroidery is placed on this is lovely too, I tend to wear biker jackets undone and the detailing on the lapels is just begging to be worn open. Painted jackets can cost a small fortune, I've always wanted a custom painted jacket but this is a way more affordable option. The roses are a classic for a reason and the style has a hand painted look to the writing. Alice & You are quickly becoming a new favourite brand for me, and this jacket covered in patches is a great example of why! It is the priciest jacket I'm featuring, but it is much more detailed than a lot of the others on this list. This is a bit more 'funky' than a flowery embroidered jacket, perfect for someone who loves tattoos. For an instant classic, this jacket from Navabi is a bargain at £38.99. This feels much more chic and high fashion that most of the other faux leather jackets because it doesn't have the collar. It creates a totally different silhouette to most biker jackets and Zizzi as a brand are always fantastic quality. New Look have really killed it with these biker jackets, and this one is a real star. It has a more worn look than the others which appeals to me a lot. It's not often you see a faux leather jacket that is a bit bulkier and worn looking so this is a treat. I have 3 faux leather jackets, and might just have to add a couple more to my wardrobe this spring. Ooooh! Those colourful leather jackets from New Look are too yummy! And the zizzi one too! I want all the pleather! The yellow!!!!! I have the pale pink version but so would have got the yellow if I'd seen it!